Last week I summarized the work I have been doing during the summer for my Final Year Project. In that entry I also published a video which showed the reconstruction of a map with the last version of my FYP. The problem of that implementation was that consisted in the alignment of consecutive frames (pairwise alignment), so that suffered from error accumulation. In today's entry I will briefly talk about the advances of this week as well as the steps I'm taking to accomplish the next milestone: loop detection and graph optimization to avoid error accumulation. Loop detection and graph optimization: in this phrase we can distinguish two different tasks, although closely linked. The first task consist in the identification of a previously visited place (loop). 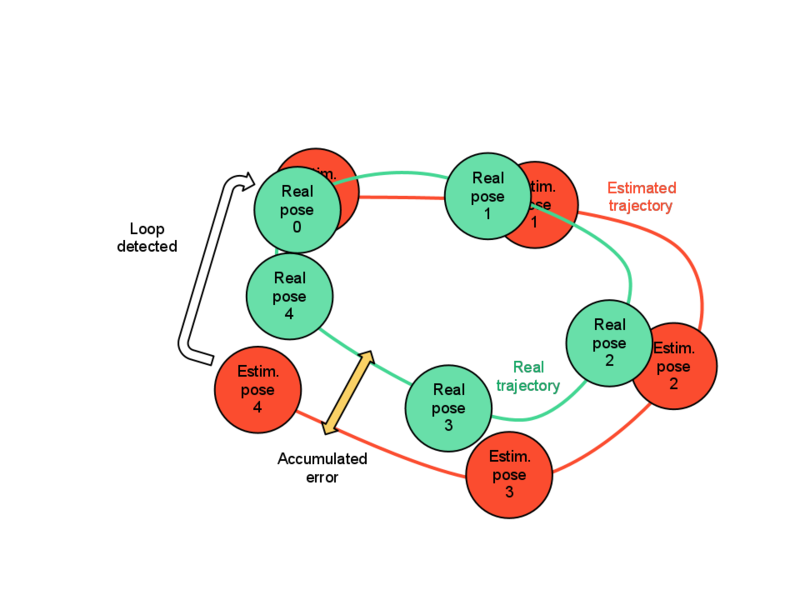 This way, when a loop is detected, a new relation is added to the graph that relates the current pose with the pose in the past where we visited the same place. 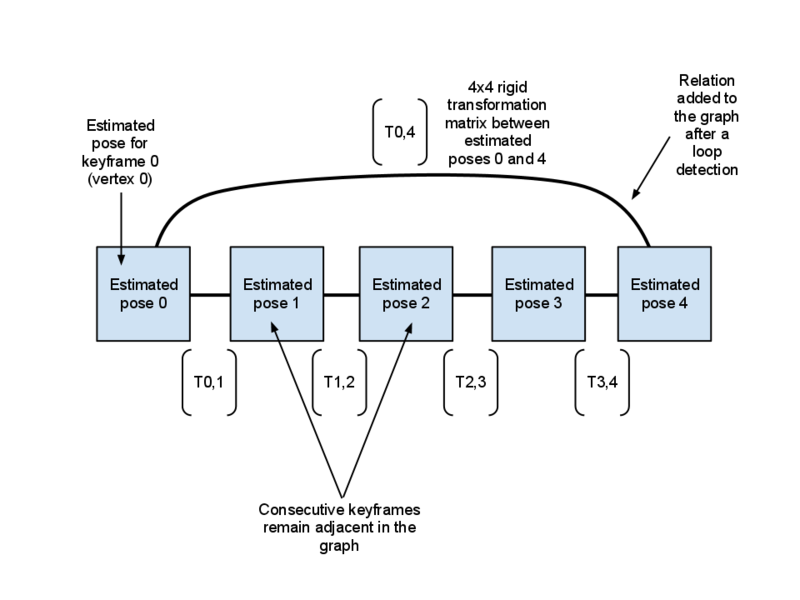 The second task tries to reduce the accumulated error from the pose estimation based on pairwise alignment. Thus, each time a certain place is revisited (a loop is detected), a new relation is added to the graph and the graph optimization process is launched to minimize the accumulated error. This will get more consistent maps, especially when a place is revisited after a long way. I haven't integrated the graph optimization process in my project yet, nevertheless I'm working in that direction. I first decided to start implementing a new version of my project that could detect loops. To this end, I opted for a simple implementation that is based on visual feature matching to determine if an area has been visited or not. I have created a keyframe chain that stores a subset of previously grabbed frames. In each iteration, if the camera has substantially shifted, feature matching is performed with stored keyframes. This way, if the number of resulting inliers is above a certain threshold, I consider that the current frame and the keyframe to which pairwise alignment is performed, correspond to the same place. Furthermore, to avoid performance penalty matching features against every stored keyframe, I have considered the pose information of each keyframe. 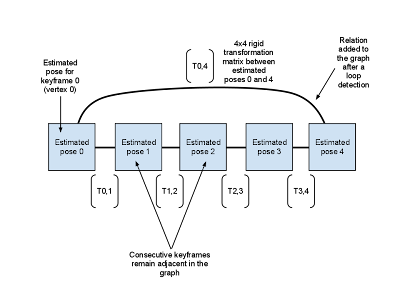 Thus, feature matching is only performed with keyframes which pose are close enough to the current pose. I have done some test in several rooms and the loop detection results are acceptable. In the coming days I will try to integrate the graph optimization process to see if I manage to reduce the accumulated error this way. The framework I pretend to use for this task is g2o, which has also been used in "Realtime Visual and Point Cloud SLAM" by Nicola Fioraio and Kurt Konolige that could be found here: http://openslam.org/g2o. b) build a "global" kd-tree with ALL features. The bad side of (b) is that the kd-tree must be rebuilt with each new key-frame, but even so I wouldn't discard that idea and compare both approaches.